In May, Six Flags Over Georgia plans to introduce a new ride with cars programmed to rapidly twist and turn 360 degrees as it moves at a high speed, to ensure that passengers do not miss any of the action, according to the Marietta Daily Journal. With these potentially harmful designs, Atlantans may be wondering, what are the safety procedures for amusement park rides? The new ride is called Justice League: Battle for Metropolis, and it will feature a few surprises, including fire, mist, fog effects and a vehicle that rocks and spins, according to the MDJ. The effects, combined with ride’s movements, and computer effects that will be projected on curved screens are designed to make passengers feel as if they are zooming and spinning through Metropolis. “We are going to go spinning. You really feel the thrill of the ride vehicle. We’re really pushing it to the limit here,” Gene Petriello, Six Flags communications manager, told the MDJ. With this limit pushing and the potential of malfunctions on amusement park rides, Atlanta passengers may fall victim to an injury or fatality. Here’s what you should know when it comes to amusement park ride safety. Have There Been Amusement Park Ride Accidents in Georgia? Amusement parks across the U.S. report more than 1,000 injuries every year since 2001, according to CNN News. Statistics collected by the National Safety Council show that in 2014, the most recent year for which data is available, 1,146 people suffered ride-related injuries, with 111 of those classified as serious. Georgia has seen its own share of amusement park accidents. On Aug. 26, a group of bystanders at the Bartow County Fair in Cartersville Georgia rushed to hold up a children’s roller coaster after it suddenly collapsed, according to ABC News. The group rescued seven children on the ride when it malfunctioned. The ride was immediately closed after the incident with the state’s fire commissioner ordering reinspections of all the rides at the fair. On Oct. 6, in the city of Rome, a ride malfunctioned which caused the door of the ride car to open, and jarred loose the harness holding in a 13-year-old boy, according to NBC 11Alive. Luckily, the boy was able to grab the harness and hold on, which left him dangling 30 feet above the ground. The boy was rescued by ride technicians with the child’s father telling 11Alive that he wants to make sure this type of accident does not happen to another rider or family. The ride has been closed since the incident. Amusement parks and mobile carnivals were once regulated by the Federal Consumer Product Safety Commission. However, in 1981, Congress revoked that authority, and placed regulatory power in the hands of state and local governments, according to CNN News. Not every state regulates amusement parks though. There are about 10 states, including Washington and Tennessee, that have no state oversight and leave inspections up to county governments or private inspectors, according to CNN. In Georgia, the Office of Insurance and Safety Fire Commissioner regulates the state’s amusement parks by inspecting rides annually and performing additional spot-checks, according to Saferparks, a public service organization that promotes safe design, operation and use of amusement rides and devices. Even though states have the power to regulate amusement parks, public officials are fighting for national oversight. Sen. Ed Markey from Massachusetts introduced a bill in six consecutive Congresses calling for the Consumer Product Safety Commission to once again have jurisdiction over the industry, according to NPR. “A baby stroller is subject to tougher federal regulation than a roller coaster carrying a child in excess of 100 miles per hour. We need to make amusement parks subject to the regulatory authority of the Consumer Product Safety Commission, which can provide safety expertise and regulatory enforcement over these rides,” Markey said in a statement. How Can You Stay Safe On Amusement Park Rides? Even though many rides are examined by inspectors, it is still important to keep a watchful on eye on them before boarding. 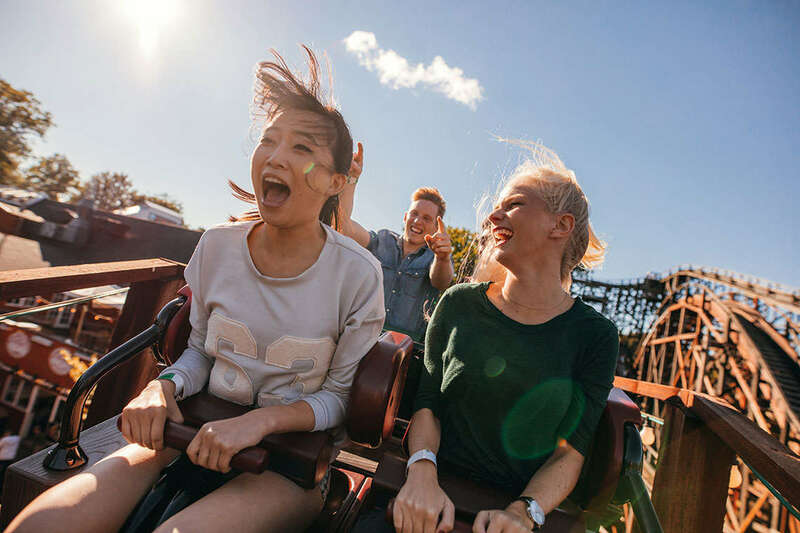 If a ride looks rickety or unstable, or if any part or your seat seems loose or broken, it may best to skip the ride, according to USA Today. Also, you should report any unsafe conditions to a park supervisor or manager. Most high velocity-rides carry a minimum height requirement. It is important that you don’t try to sneak a child onto a ride if they don’t meet the requirement, because they might be too small for the restraints to work effectively, according to USA Today. Smaller riders are more prone to sliding around on a seat and potentially ending up in a dangerous position. Even riders who are tall or heavy might not fit properly in a seat, which can make it difficult to restrain them and can cause them to fall out during the ride, according to USA Today. Most modern amusement park rides are built with fail-safe technology, which helps to keep the ride from launching unless all safety restraints are properly fastened and the track ahead is clear, according to USA Today. However, older and smaller rides may depend on the operator’s manual control. Before boarding a ride, you could keep an eye on the ride operator, and skip the ride if they seem uncaring or inattentive. Many amusement park accidents are caused by intentional or unintentional rider behavior, according to USA Today. Some people may panic and try to get off a moving ride, or others may get involved in horseplay on a ride. To help prevent any accidents, keep your feet on the floor, face forward with your head back against the headrest, and stay fully seated, according to USA Today. Brace yourself with your hands on the grab bar or keep your hands on your lap. Wear your seatbelt or any restraints at all times and make sure they are properly fastened. If the ride starts to move and your restraint is not in place, immediately yell for help, according to USA Today. Amusement park rides may be fun and thrilling, but it is important to watch out for any unsafe conditions that could cause you or any fellow passengers harm. However, even while following safety protocols, accidents can still occur. If you or a loved one were injured on an amusement park ride, we may be able to help. Read more to learn how our premises liability lawyers in Atlanta can help recover compensation for your injuries. If you are ready to pursue a claim, please fill out our free, no-risk case evaluation form today.